Once you fold your handlebars out of the way with a folding stem, your bike is as wide as its pedals. These quick-removing MKZ pedals come off in seconds without any tools, so you can fit your bike in less space for storage or transportation. 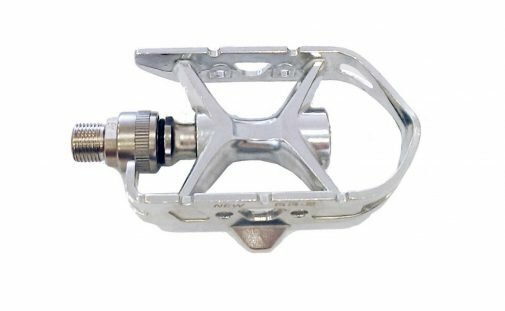 NOTE #1: Flatbike will be discontinuing these MKZ pedals in 2018, replaced by pop-off pedals in the interchangeable Wellgo system that include standard flat pedals, wide MTB pedals, and SPD racing pedals. NOTE #2: All CHANGE bikes already come with Wellgo pop-off pedals as standard equipment. Results in a narrower bike footprint than with regular or even folding pedals. Saves your shins from scraping when you are walking your bike. When used with a folding stem, allows for more bikes carried on a bike rack. Allows use of toe straps for more efficient cycling.